It's time to take your business to the next level. Eileen Sharp and Vic Hightower were frustrated. After years of profitable, predictable growth, Swan Services was in a rut. Meetings were called and discussions held, but few decisions were made and even less got done. People were pointing fingers and assigning blame, but nothing happened to solve Swan's mounting problems. It felt as though they were working harder than ever but with less impact. The company Eileen and Vic had founded and built for 10 years was a different place. Their story is not unusual, and the challenges they were facing are common--and solvable. Get A Grip tells the story of how Swan Services resolves its issues by implementing the Entrepreneurial Operating System®. With the help of EOS, Eileen, Vic, and their leadership team learn to develop and commit to a clear vision, establish focus, build discipline, and create a healthier and more cohesive team. The story of Swan Services is a fable, but the Entrepreneurial Operating System®, a complete entrepreneurial toolkit, is very real and has helped thousands of businesses worldwide. 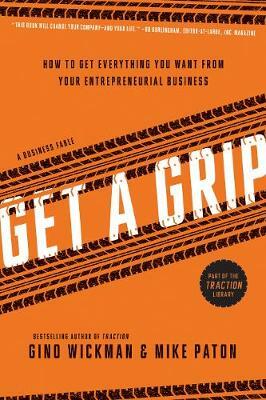 With characters and situations created from collective business experiences and stories, Get A Grip is a fable that will ring true for entrepreneurial leaders the world over and guide them to get their companies on track.